I mentioned a while back that I was considering a navel-gazey post about trying to find a new alarm clock. Well, here goes. I love my alarm clock. It’s a Timex travel alarm clock with an Indiglo backlight. I have owned it for longer than just about everything else that I have owned. I think I was given it as a graduation present during high school. It’s possible that I have had it longer than that. I just don’t remember. I took it with me to on my mission, that’s for certain. It’s followed me from Wyoming to Utah to Michigan. Most everything else has been discarded or acquired somewhere along the line. My alarm clock looks kind of like this one, but it doesn't have that extension at the back. I am perfectly attenuated to it. I know exactly when it will go off after a snooze and can usually drag myself out of bed a few moments before it sounds. If for some reason I’m not around to silence it, or I’m already in the shower, I know that it will ring for exactly one minute and then stop. I even love the short high pitched sound it makes when I hit the snooze button. It’s more than 10 years old by now, and with age, my alarm clock has developed some quirks. Among others, it resets itself and loses the set alarm if it falls off my nightstand (or, as usually happens, when it gets forcibly knocked off my nightstand during the night terrors). This can be problematic, as you might imagine. It used to take a huge drop, but even gentle bumps will reset it these days. So, reluctantly, last winter, I decided it was time to start auditioning new alarm clocks before it became terribly critical. I had only a few requirements: #1 Battery operated #2 Easy to read in the dark without my contacts in. Actually, #1 is a function of #2, because I usually have to hold it pretty close to my face, and if it were one of those big ones with a power cord, I’d smash my face frequently. The first trial has ended unsuccessfully. Instead of replacing my alarm clock, I’ve just had two sitting on my nightstand in case one fails. The only things that I like about the new one was that it automatically reset itself for Daylight Savings Time. It was insufficient in all other aspects of alarm-clockery. The backlight is terrible. It rings for too long and at the wrong intervals. For some reason, it has a thermometer which is consistently overly optimistic about how warm my bedroom is. In another oddly designed “feature”, if I hit the backlight, it shows me what time the alarm is set for, rather than what time it is, which has led to a few panicked moments. So, on to round two, I guess. 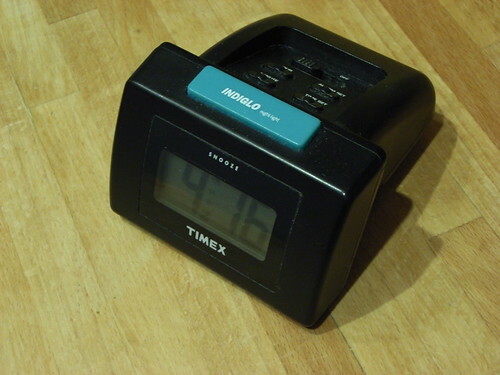 Anyone know where I can find a brand new Timex Indiglo Travel Alarm clock, vintage 1998, perchance? Or have an awesome alarm clock that snoozes for exactly 8 minutes? This made me laugh 🙂 Thanks. I use an Indiglo Travel Alarm clock! I’m pretty sure it came from Walgreens for Christmas (my dad has a habit of going to Walgreens every Christmas Eve and buying all the kids random gifts). Abe uses the alarm clock that I got for Christmas when I was 11 years old. My EXACT reason for coming across this site – looking for that exact alarm clock. Did you ever find one? I never did. But the original is still going strong!